BOSTON – Just for the record, I’m a huge fan of “The Simpsons.” The animated comedy has skillfully skewered virtually every aspect of American culture for more than a quarter-century and earned an iconic status in the Panthenon of American pop culture. I’m not sure how you view “The Simpsons” will influence your reaction to the Lyric Stage Company of Boston’s production of “Mr. Burns, A Post-Electric Play,” directed by the Lyric Stage’s associate artistic director, A. Nora Long. In Anne Washburn’s post-apocalyptic world, episodes of “The Simpsons” – one episode in particular – bind survivors together after all other aspects of our culture have apparently been wiped out. Theater should make us uncomfortable, and make us question our own thoughts and beliefs, and there is nothing comforting about Washburn’s bleak post-nuclear winter. “Mr. Burns” has been one of the most-produced plays in the country over the last year, but given the experimental nature of the piece, Lyric probably had to think long and hard about staging it. It is risky and chance-taking, and has a fringe theater spirit to it – and that is meant in the best possible sense of the phrase — but in the end you may find it confusing and disjointed. It takes place during three very distinct and different acts spread over 82 years. A noise in the woods turns out to be a man called Gibson (Nael Nacer), who has been hiking through the barren countryside. Gibson is welcomed when it appears he can add to the discussion of an episode of “The Simpsons” called “Cape Feare,” based on the movie “Cape Fear,” which was made twice, once starring Robert Mitchum, and later with Robert DeNiro. Gibson and the group also trade news about the bleakness of the situation: the number of dead, the names of survivors, what has happened in nearby states and cities,multiple nuclear disasters involving reactors on the scale of Chernobyl, and the loss of the electrical grid. We are given no information on the how and the why of the situation. Washburn shows us how a simple bit of pop culture can bring us together in the worst of times and can bond us when it seems that all bonds between people have been broken. Seven years later, the cast comprises a a touring theatrical group that performs episodes of “The Simpsons” and commercials recreating the experience of watching television. They are competing against other groups doing the same thing and the group is heavily engaged in the “buying of lines,” snippets of Simpsons episodes from outside sources that will flesh out their presentations and lift them above their rivals. Act II’s ending is dramatic but puzzling. 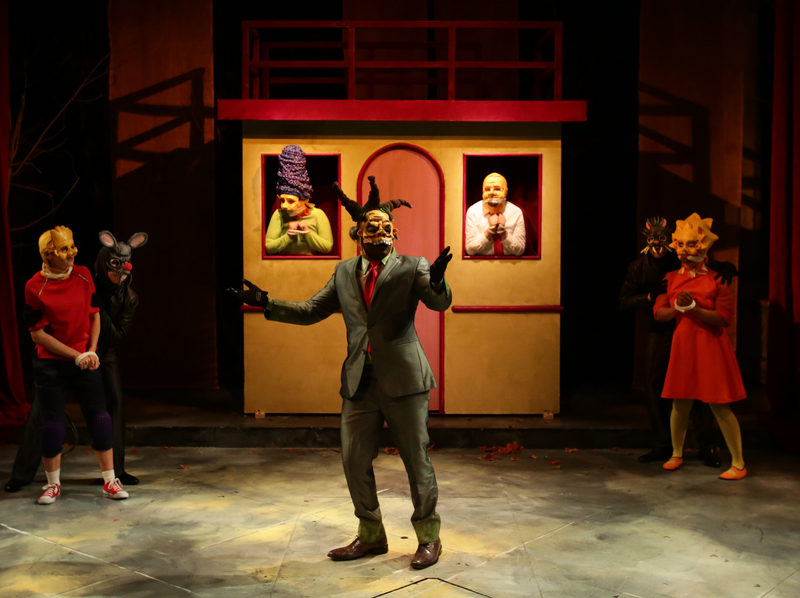 Seventy five years later, in the third act, civilization has progressed to the point where a theater troupe is able to stage fully-mounted operetta, with the cast now wearing masks designed by Lauren Duffy, depicting Simpsons characters. The operetta, with music by Michael Friedman, and lyrics by Washburn, has its moments, infused with bits and pieces of pop culture such as Gilbert & Sullivan operettas. The most successful Simpson portrayal is by Brandon G. Green – a standout in Company One’s recent production of “An Octoroon” – as Mr. Burns, the despotic owner of Springfield’s nuclear power plant, with a few other credible imitations and replications of Simspon characters. The hardworking cast, besides the aforementioned Nacer and Green, includes Jordan Clark, Aimee Doherty, Gillian Mackay-Smith, Joseph Marrella, and Lindsey McWhorter. They are all in with Washburn’s vision of an evolving future after unimaginable disaster. Taken together, the disparate acts are ultimately meant to be a symbol of a larger truth. Unfortunately, you may not – especially given the gaps in information – be able to connect the dots and leave the theater knowing what that truth is.